The VA scandal has its roots in two related management failures. Government leaders everywhere should keep them in mind. As the Department of Veterans Affairs begins the long, difficult and expensive process of addressing the problems that led to its scandal over falsified wait times for veterans seeking medical appointments, government managers who want to keep their own enterprises out of the same kind trouble would do well to look at the elements that brought the VA down. At the heart of the VA scandal is the falsification of records in the face of a huge surge in veterans needing care and insufficient resources to serve them. One study by federal auditors found that, while official VA reports claimed that some vets waited 24 days for an appointment, the average wait time was actually 115 days. And there is another, equally troubling aspect to the scandal: the harsh reprisals to which VA workers who tried to report wrongdoing were subjected. At the core, I think the VA’s problems were driven by two factors: the misuse of performance measures and an agency culture that didn’t respect candor. On the performance measures problem, VA leaders made an understandable and common mistake. To get employees’ attention, they put a huge emphasis on a single measure: All vets will have an appointment at a health clinic within 14 days of their request. Given the mismatch of demand and resources, there was no way the staff could achieve that laudable goal. Nor did the goal make sense: Vets with serious problems should be seen immediately, while it’s reasonable for those seeking an annual checkup to wait several weeks or more. Further, many supervisors’ bonuses depended on the performance numbers. Put these factors together — one all-important but unreachable goal, with one’s pay riding on the outcome — and it was a disaster waiting to happen. To some, the candor issue might have been surprising. After all, former Veterans Affairs secretary Eric Shinseki spent three weeks in the field each year holding dozens of meetings with employees and supervisors at which he insisted on candor. But the bad news never got to him. It’s not hard to see why. A VA scheduler had to decide whether to listen to the supervisor sitting down the hall who said to game the system or to the department’s top leader who meant well but was thousands of miles removed. Tragically, all too many followed their supervisors’ orders, and those who didn’t were often punished. So how do you turn this situation around? Provide mandatory ethics training? Fire the supervisors who told staff to cook the books? Bring in a whole new team of leaders and managers? Management consultants often say that “what gets measured gets managed.” But when you have a single, impossible-to-achieve, high stakes measure, nobody should be surprised when some people game the system. A far smarter approach is to use a version of “the balanced scorecard,” which captures data on four key performance areas: financials, customer satisfaction, internal operations and employee learning/growth. 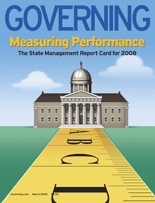 Many public and private organizations have used versions of the scorecard with good results. There is no one meaningful metric that captures all that matters in an agency. Adopting a few (emphasize few) measures is far more realistic and effective. In addition to using a balanced set of measures, managers need to involve employees and supervisors in devising those measures. The measures need to be ambitious but not impossible; they need to focus on things that staff has the power to control. They need to give managers and supervisors (as well as external stakeholders) data that they find useful. The VA’s all-important metric — a health-care appointment within 14 days — failed each of these tests. • Model candor at the top. When leaders acknowledge mistakes that they or their agency have made, it sets the right tone. • Talk about the reasons that candor is so critical. The point isn’t candor for its own sake (although that’s a good thing). It’s to continually spot problems and opportunities for improvement. • Craft a simple narrative that highlights the cost of stifling candor. NASA’s Challenger tragedy wouldn’t have happened had NASA’s managers been open to the engineers who tried to warn them that it was too cold to launch the spacecraft. If you say, “We can’t have another Challenger disaster” at the space agency today, people quickly understand the message. • Work closely with your middle managers; they are the key. When senior managers frequently meet with those in the middle, they should ask them what’s going well and what isn’t, and make it safe and rewarding to talk openly about problems. When middle managers experience the power of operating in an open environment, they let their guards down and realize that candor improves agency performance (as well as their own careers). The Department of Veterans Affairs is in serious trouble. So are other public agencies that relentlessly track one high-stakes measure and that allow retaliation to replace candor. We should all take a lesson from the VA.